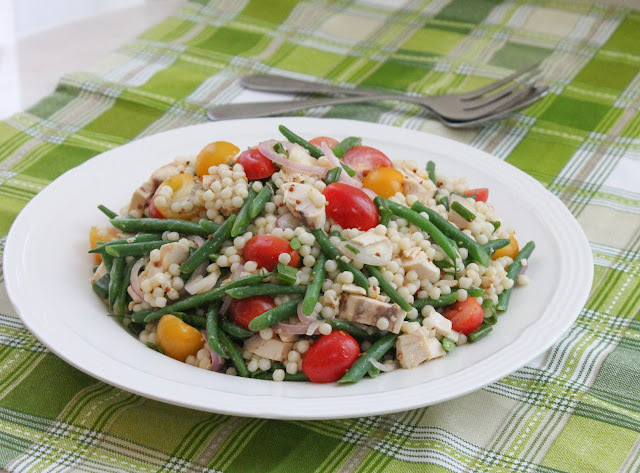 Just cooked crunchy green beans and ripe sweet cherry tomatoes perk up this lovely salad made with pearl couscous, augmented with chicken, and dressed with raspberry vinegar and whole grain mustard. Once again, I’m sharing a recipe perfect for my self-imposed Salad Month. 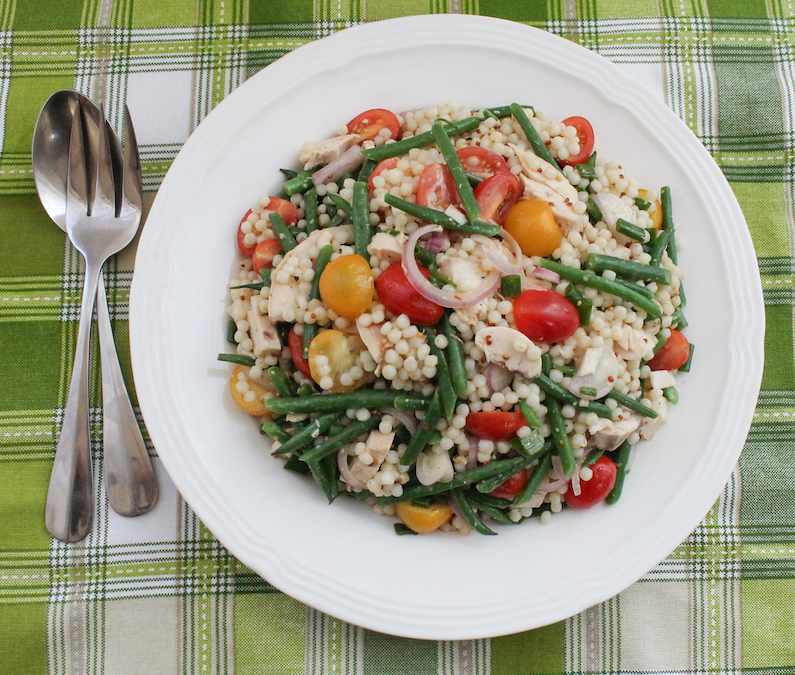 This Crunchy Green Bean, Tomato, Chicken and Pearl Couscous Salad is another of our favorites when it’s hot outside. 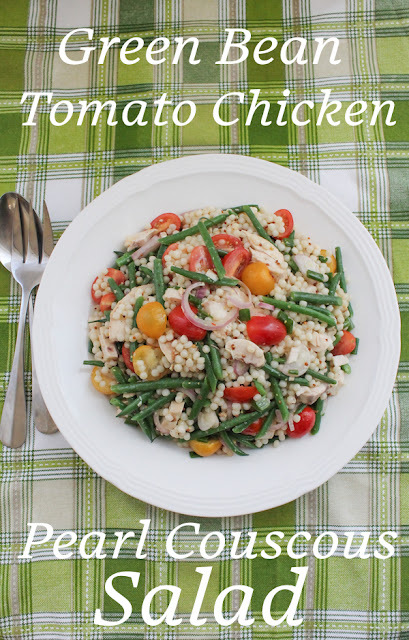 It’s light yet, because of the pearl couscous and chicken, it’s filling enough to be a meal on its own. Or, if you want, omit the chicken from the salad and serve it as a side dish. If you are not familiar with pearl couscous, also known as mograbia, it’s made from a moistened bulgur wheat paste which is rolled into small balls. The balls are coated with finely ground hard white wheat flour and dried. Those who still make pearl couscous in the traditional manner hand roll the balls and dry them in the sun. I bought mine in a bag at my local grocery store. My younger daughter (and the Boxer boy) will eat green beans completely raw. I prefer mine blanched for salads but you do you. If you like them uncooked, skip the first step of this recipe. Either way, this is another instance where the ingredients are simple, but the finished dish is more than the sum of its parts. The bonus is that, if you make enough to last until the next day, this salad tastes just as good, possibly even better. Bring a pot of water to the boil and blanch the green beans for 2 1/2-3 minutes. Drain and refresh them in some ice water so they stop cooking. Drain well. Cook the couscous as you would pasta in salted water, boiling till the little balls are al dente, that is, soft but still with a little firmness. (Follow your package instructions for the best results.) Drain and rinse and leave to cool for a few minutes. 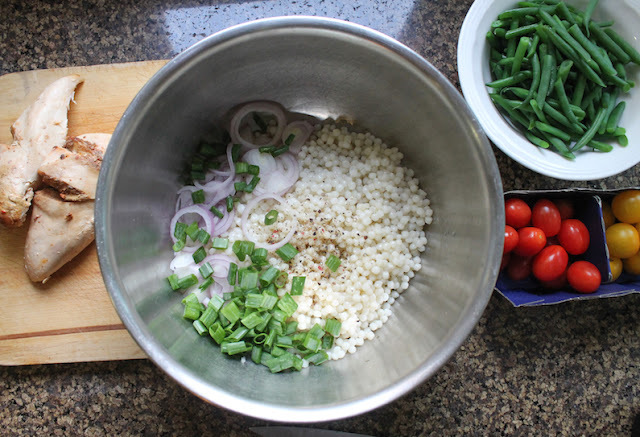 Toss the warm pearl couscous in a large salad bowl with the sliced onion and chopped green onion tops. Season with a few grinds of black pepper. Shake the dressing ingredients together in a clean jar until well combined and pour over the couscous. Stir well. 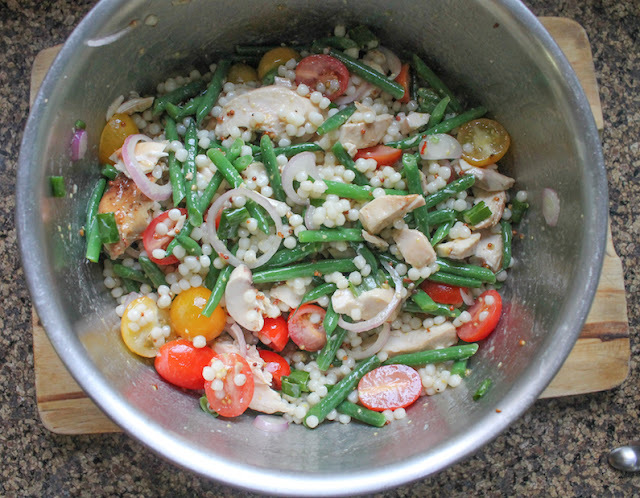 Add in the crunchy green beans, halved cherry tomatoes and the chicken. Toss well. Taste for salt and pepper and add more if necessary. Do you keep cool in summer by eating salads too? Here are a few you are sure to enjoy!